137 Marlborough (317 Dartmouth) is located on the NE corner of Marlborough and Dartmouth, with 135 Marlborough to the east, 163 Marlborough to the west, across Dartmouth. 319 Dartmouth to the north, and 315 Dartmouth to the south, across Marlborough. 137 Marlborough was designed by Bigelow and Wadsworth, architects, and built in mid-1925 by the Leighton-Mitchell Company, general contractors, as an eight-unit cooperative apartment building. It was built for the 137 Marlboro Street Trust (Victor T. Goggin, James M. Riley, and Richard DeBlois Boardman, trustees), replacing a townhouse at 317 Dartmouth built ca. 1870 which the Trust acquired on July 27. 1925. Click here for an index to the deeds for 137 Marlborough. Floor plans for the building are included in the City of Boston Blueprints Collection in the Boston Public Library’s Arts Department (reference BIN N-17). Click here to view scans of the original floor plans. On July 30, 1943, the Suffolk Savings Bank for Seamen and Others foreclosed on its mortgage to the 137 Marlborough Street Trust and took possession of the property. On October 29, 1943, 137 Marlborough was acquired from the bank by Celia Leeder, the wife of real estate dealer Frank Leeder, and Adelaide (Ober) Friedman, the wife of wholesale shoe merchant Simon Friedman. On September 17, 1948, 137 Marlborough was acquired from Celia Leeder and Adelaide Friedman (conveyed through real estate dealer Ray C. Johnson) by Mildred (Farrar) Sawyer, the wife of Frank Sawyer. Frank Sawyer was president of the Checker Cab Company and the Transportation Mutual Insurance Company. He also developed the Avis car rental company into Avis International and served as its chairman until his retirement in the 1980s. The Sawyers lived at 203 Bay State Road and later in Chestnut Hill. In December of 1949, Frank Sawyer acquired 319 Dartmouth. On January 27, 1961, 137 Marlborough was acquired from Mildred Sawyer by The Laurens Cook Corporation (Laurens I. Cook, president and treasurer). On July 16, 1964, it transferred the property to its affiliate, Cook Properties, Inc.
On January 8, 1965, 137 Marlborough was acquired from Cook Properties by real estate developer Nathan R. Miller. On August 4, 1971, he converted 137 Marlborough into ten condominium units, the 137 Marlborough Street Condominium. 317 Dartmouth was built ca. 1869 by Hiram P. Bean, mason, one of three houses (317-319-321 Dartmouth) built at the same time as a symmetrical composition, with a bow in the center and octagonal bays at either end. In the appendix to his Houses of Boston’s Back Bay, Bainbridge Bunting indicates that “letters and office records of Sturgis and Brigham currently being studied by Margaret Henderson Floyd indicate that firm as the original designers of 317 Dartmouth.” He does not attribute 319-321 Dartmouth to the firm, but based on the design and the fact that they were built at the same time by the same builder, it appears likely that Sturgis and Brigham designed all three. Bunting also indicates that 317-319-321 Dartmouth were built for building contractor George Wheatland, Jr. Based on the deeds for the houses, this does not appear to be correct. Hiram Bean purchased the land for 317-319-321 Dartmouth on November 25, 1868, from attorney Peleg Whitman Chandler, who had purchased the land from the Commonwealth of Massachusetts on September 19, 1865. 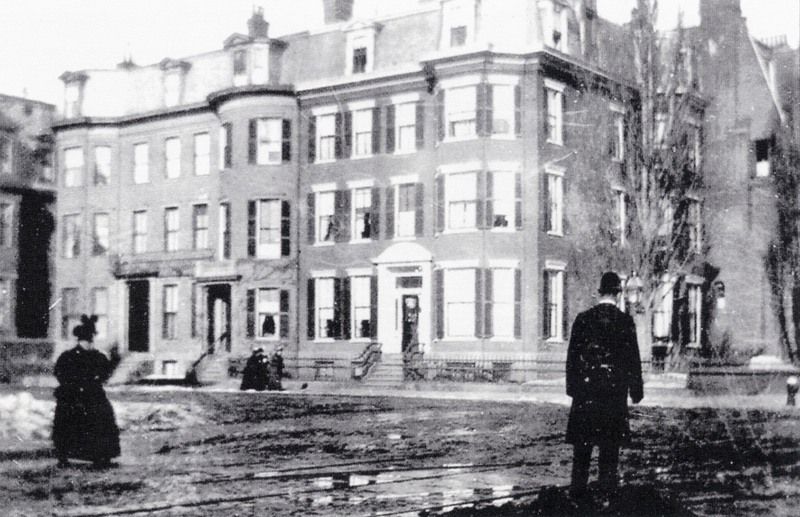 The original land was composed of three lots, two with 24 foot frontages on Marlborough and the third, at the corner of Dartmouth, with a 30 foot frontage on Marlborough. The original deeds from the Commonwealth included the standard deed restrictions for lots located on Marlborough, including requirements that the houses be set back twenty-two feet from the street. As built, the houses faced Dartmouth and, as a result, on January 7, 1870, Peleg Chandler and Hiram Bean secured a deed from the Commonwealth confirming that the houses conformed with the Commonwealth’s requirements. 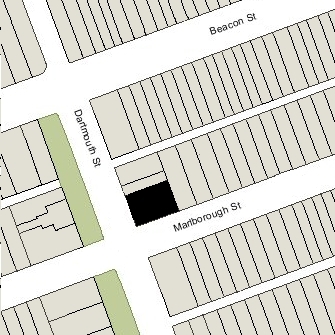 The deeds for the houses built at 319 Dartmouth and 321 Dartmouth also included a four foot wide easement across the rear of both lots allowing access to the alley for all three houses. Click here for an index to the deeds for 317 Dartmouth. On November 16, 1869, 317 Dartmouth was purchased from Hiram Bean by dry goods commission merchant Samuel Frothingham, Jr. He and his wife, Maria Louise (Whitredge) Frothingham, made it their home. They previously had lived at 110 Beacon. The Frothinghams’ son-in-law and daughter, Henry Bigelow Williams and Sarah Louisa (Frothingham) Williams, lived with them. They previously had lived in Roxbury. Sarah Williams died in July of 1871 in a carriage accident. Samuel Frothingham died in December of 1872, and Maria Frothingham and Henry Bigelow Williams moved soon thereafter. On April 15, 1873, 317 Dartmouth was purchased from Maria Frothingham by Henry Joseph Gardner. He was a commission merchant dealing in grain and had served as Governor of Massachusetts from 1855 ro 1858, a candidate of the “Know Nothing” movement. A widower, he previously had lived in Dorchester. He continued to live there in 1879. On September 18, 1879, 317 Dartmouth was acquired from Henry Gardner by Helen (Beal) Little, the wife of John Mason Little. They previously had lived at 122 Marlborough. They also maintained a home on Little’s Point in Swampscott. John Mason Little was a wholesale dry goods merchant in his father’s firm. 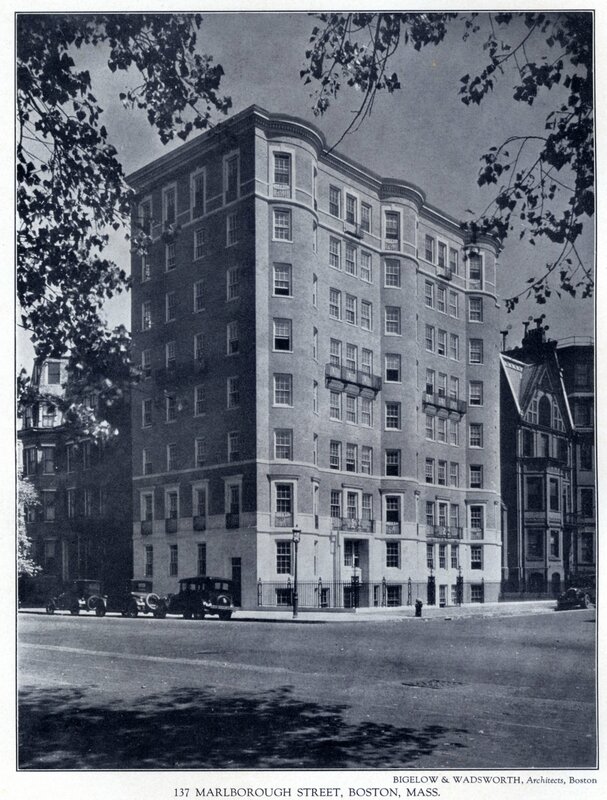 After the death of his father, James Lovell Little, in June of 1889, he served as trustee for the family estate (held in the Pelham Trust) and, in 1917, constructed the Little Building at the corner of Boylston and Tremont, a 12-story office building on the site of the Hotel Pelham. In the appendix to his Houses of Boston’s Back Bay, Bainbridge Bunting notes that 317 Dartmouth suffered a fire in 1881 and was rebuilt and enlarged in that year. In mid-1886, 317 Dartmouth was briefly the home of dry goods commission merchant Eugene Battelle and his wife, Susan Parkman (Munro) Battelle. They had lived at 134 Marlborough during the 1885-1886 winter season. They may have lived with the Littles, who also were listed at 317 Dartmouth in the 1886 City Directory. The Battelles had moved to 257 Marlborough by the 1886-1887 winter season. The Littles continued to live at 317 Dartmouth in 1888, but then made Swampscott their year-round residence for several years. During the 1888-1889 winter season, 317 Dartmouth was the home of Lewis Augustus Roberts and his wife, Harriet Maud (Gardner) Roberts, the daughter of Henry J. Gardner (who had lived there until 1879). Lewis A. Roberts was a publisher and bookseller whose firm (Roberts Bros.) published Louisa May Alcott’s Little Women in 1868. They had lived at 336 Beacon earlier in 1888. By the 1889-1890 season, they were living at the Hotel Vendôme. During the 1889-1890 winter season, 317 Dartmouth was the home of merchant George Dudley Howe and his wife Alice Lloyd (Greenwood) Howe. They also maintained a home, The Cliffs, in Manchester. During the 1890-1891 winter season, 317 Dartmouth was the home of William Sumner Appleton and his wife, Edith Stuart (Appleton) Appleton. They had lived at 456 Beacon during the previous season. Trained as an attorney, William Sumner Appleton never practiced law, but devoted himself to the study of history, numismatics, heraldry, and genealogy. He designed the seal for Harvard which was adopted by the Harvard Corporation in 1885. The Appletons had moved to 187 Beacon by the 1891-1892 season. 317 Dartmouth was not listed in the 1892 Blue Book, but by 1893, the Littles were living there once again. They continued to live at 317 Dartmouth in 1895, but during the 1894-1896 winter season were living elsewhere, and it was the home of attorney William Vail Kellen and his wife Ella Frances (Sturtevant) Kellen. They previously had lived at 7 Alveston and also maintained a home in Marion. They continued to live at 317 Dartmouth (and in Marion) during the 1896-1897 season, but moved soon thereafter to 40 Hereford, and 317 Dartmouth was once again the Littles’ home. Helen Little died in June of 1912. John Little continued to live at 317 Dartmouth until his death in October of 1919. The Littles’ two unmarried daughters, Grace Atkinson Little and Helen Beal Little, continued to live at 317 Dartmouth during the 1919-1920 winter season. Helen Little married in April of 1920 to Col. Thomas G. Barroll, a US Army officer at the time of their marriage; they moved to 2 Brimmer and he became a merchant. Grace Little moved to 160 Riverway and married in August of 1920 to Leon Feuchere, a mining engineer; after their marriage, they moved to Warren, Arizona. By the 1920-1921 winter season, 317 Dartmouth was the home of Miss Arthena Wiggin, who operated it as a lodging house. She had lived in Brookline in 1920. She continued to live there in 1924, but had moved to 208 Commonwealth by 1925. 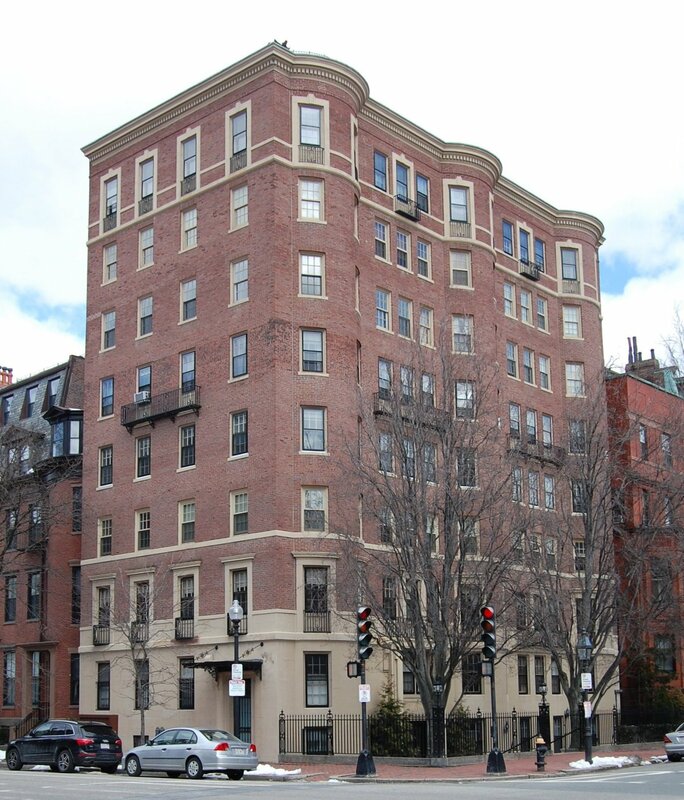 On July 27, 1925, 317 Dartmouth was purchased from Helen Little’s estate by The 137 Marlborough Street Trust. It razed the house soon thereafter.